Nicholas A. Kaldis. 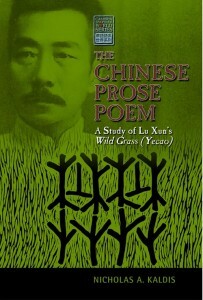 The Chinese Prose Poem: A Study of Lu Xun’s Wild Grass (Yecao). Amherst, NY: Cambria Press, 2014. 380 pp. ISBN-13: 9781604978636. 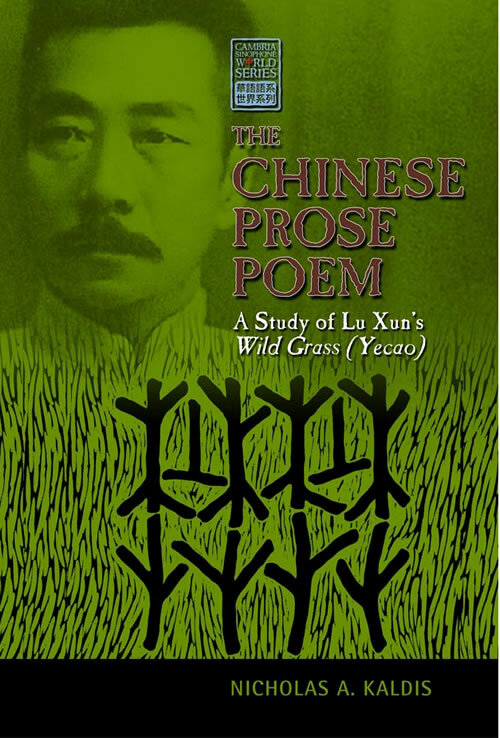 Nicholas Kaldis’s The Chinese Prose Poem: A Study of Lu Xun’s Wild Grass is the fourth major English-language study of Lu Xun to appear since 2012. In the three earlier books, authored by Eva Shan Chou, Gloria Davies, and Eileen Cheng, Jon Eugene von Kowallis detects a “new enthusiasm” for this most deeply entrenched figure in the making of modern Chinese literature, and suggests that the passing of the Cold War communist threat has allowed a more broad-minded “post-socialist reappraisal” of Lu Xun. That reappraisal, Kowallis notes, shares a focus on Lu Xun’s response to issues of violence, trauma, and memory in China’s passage to modernity. Those themes emerge, too, in The Chinese Prose Poem. But where Chou, Davies, and Cheng range widely over Lu Xun’s biography and ouevre, Kaldis has chosen to interrogate in depth a small but vital corner of the author’s literary output: the twenty-four prose poems that comprise the 1927 collection Wild Grass (Yecao). Kaldis calls his book a “companion” to Yecao in that he designed it as a reference and bibliographic source, a dialogue with existing scholarship, and a close interpretive engagement with the prose poems themselves. Organizationally, the book achieves all this by dedicating the first three chapters, respectively, to theoretical, historical-political, and generic approaches to Yecao. The much more lengthy fourth chapter offers intensive readings of each individual prose poem. As a reference work, the book fulfills its role by underlying the entire project with extensive scholarly apparatus. For instance, of the 135 pages comprising chapters one through three, forty-six pages, or over one-third of the content, are endnotes. This extensive supplementary matter provides a rich fund of secondary observations, such as notes on translation, intertextual connections with Lu Xun’s other writings, and most prominently, background dialogue with the voluminous English- and Chinese-language studies of Yecao. Those studies alone represent a small sea of scholarship, all indexed in the book’s substantial sixty-page bibliography, a feat of compilation that stands as a scholarly resource in and of itself. Clearly, The Chinese Prose Poem is not aimed at the casual reader; but for that matter, neither was Yecao. Chapter 1, entitled “Abreaction through Artistic Mediation,” gives a theoretical explication of Lu Xun’s artistic praxis. Here, like many before him, Kaldis takes as point of departure the “Preface” to Lu Xun’s short story collection A Call to Arms. Describing this canonical text as the “definitive summary of Lu Xun’s mature aesthetic thought,” Kaldis approaches it through a psychoanalytical lens that draws on the work of Sigmund Freud, Julia Kristeva, and Walter A. Davis, among others. At center in Kaldis’s re-reading of “Preface” is the Freudian process of “abreaction,” the uncontrolled re-experiencing of a traumatic event, akin to what is now called post-traumatic stress disorder. But where psychoanalytic convention dictates that such historical, experiential trauma can be remediated through narrative and linguistic structures that return the subject to the symbolic order, Kaldis instead sees Lu Xun of the “Preface,” of the early short stories, and of the Yecao poems, as using literary creation to deliberately exacerbate and reawaken painful memories, such that “sustained engagement with trauma continually reanimated the conflicts that dominated Lu Xun’s inner world” (23). As already noted, Kaldis is not the first to link Lu Xun’s writing to trauma and memory. But he takes that approach a step further. Citing Walter A. Davis’s idea of art as a primary way of knowing the world, Kaldis proposes a “hermeneutics of engagement” between text and reader, whereby readers of Yecao would “undergo empathetically a similar painful engagement with the truths of their own lives, in order to bring about a change in their self-understanding and socio-historical awareness” (29). In other words, Lu Xun’s writing is didactic, though in a quite sophisticated and, for its time, experimental way. Whether one views literary didacticism in a negative or positive light, it rings true to Lu Xun’s mission as a modern man of letters deeply concerned with his role as a writer and intellectual leader of his times. Chapter 2, “Lived and Literary Existence: Reinterpreting Lu Xun’s Yecao Period,” lays out the historical, political, and biographical context for the creation of Yecao in Beijing during the mid-1920s. The chapter documents events large and small surrounding Lu Xun in the mid-1920s, from warlord military campaigns to student protests to family troubles, but cautions against reading Yecao as an “index of correspondences” to specific historical, political, and biographical events. Instead, Kaldis examines Lu Xun’s essays of this period to draw out the strong Nietzschean-existential impulse that mediated the author’s lived and literary existences, giving him a position from which to confront and critique Chinese morals and civilization through painful, bitter self-dissection. Such negativity, Kaldis concludes, defined Lu Xun’s worldview during the time he conceived and composed the pieces collected in Yecao. Chapter 3 shifts the focus to genre, inquiring into Lu Xun’s choice of the prose poem form for his experimental ruminations. The several sections of the chapter negotiate the ambiguous origins and slippery definitions of the prose poem, both in the west and in China, while also touching upon, and rejecting, the notion of significant, direct influence on Yecao from the prose poetry of Turgenev and Baudelaire, both well-known in China during the 1920s, or from the traditional Chinese fu form, or from a set of five early prose poems by Lu Xun in 1919. Probably the most important factor in Lu Xun’s choice of genre, Kaldis concludes, was the prose poem’s very lack of any fixed form, which made it an ideal vehicle for experimental writing. Not to be overlooked, either, was the unrestricted venue Lu Xun had for such literary experiments: the journal Threads of Talk 語絲, where he published serially the twenty-four poems, under his own editorial supervision. Where other English-language studies of Lu Xun pick and choose among the Yecao poems on the way toward constructing larger arguments, Kaldis in Chapter 4 reads and interprets them all, in order, from beginning to end. Structuring a book chapter in this way necessarily sacrifices continuity; the poems are far too diverse in style and form to build from one to the other, nor is there any apparent ordering of the pieces in the collection; or if there is, Kaldis does not discuss it. What we must rely on instead is a strategy of reading by which the Yecao poems are treated as “autonomous acts of artistic cognition” (147) with each poem comprehended on its own terms in a manner that “affirms the primacy and integrity of the literary work” (146). The first three chapters provide firm grounding for this method, first by arguing for psychoanalytic interpretation detached from, but not ignorant of, historical background and literary influence, and second, by affirming the mutability and generic indeterminacy of the prose poem form. As a whole, the close readings of the twenty-four poems remain true to Kaldis’s interpretive approach. He works with linguistic, structural, imagistic, and dramatic attributes intrinsic to each piece, directs us to important allusions to Chinese and western literature and philosophy, and frequently refers the Yecao poems to Lu Xun’s other writings, all done without losing sight of the existential-psychoanalytic interpretive framework developed in Chapter 1. The Chinese Prose Poem lives up to its promise as a scholarly reference and reader’s companion to some of Lu Xun’s most challenging and enigmatic work. Of equal importance, the book reaffirms the value of the close reading of literature, implicitly arguing, along with Lu Xun, that serious literature does matter and might change its readers for the better, given that those readers are willing to put in the effort of close, thoughtful analysis and reflection. Finally, with this book joining three other recent full-length studies of Lu Xun, one cannot help but speculate: Coincidence or trend? Responses to that question could speak in interesting ways to the state of the field of modern Chinese literary studies. But one thing is certain: Lu Xun is in no danger of fading from the canon of modern Chinese literature. Jon Eugene von Kowallis, “Lu Xun on Our Minds: The Post-Socialist Reappraisal; Chou, Memory, Violence, Queues: Lu Xun Interprets China; Davies, Lu Xun’s Revolution: Writing in a Time of Violence; Cheng, Literary Remains: Death, Trauma, and Lu Xun’s Refusal to Mourn.” The Journal of Asian Studies, 73, no. 3 (Aug. 2014):, 581-587.